Every team is different. Some players need to feel it on the court before they see it. That's fine. And normal. Yet as we're starting to see there is nothing normal about this team. You could start in the end-of-practice huddle 11 days ago, when Charles Matthews barked at his teammates to stop. "No! No! No! No! No!" bellowed U-M's junior small forward. "That's not what we're saying." His Michigan basketball teammates had just completed their first practice preparing for Montana. It was a Monday, and he wanted to change their collective sign-off as they broke their traditional center-court gathering. "One, two, three … 'national champions' is what we're saying," he told them. So, they tented their arms as they stood in a circle and hollered: "National Champions!" It was a small moment in a season trending large, and it makes for a good story. Yet it's not the place to start. You'd have to go back further. Way back. Before the leaves fell. When the football team consumed the campus and the men's basketball coach, John Beilein, noticed how easily his players were absorbing information. Reams of it. Clip after clip after clip. "No," he would tell them, tapping his finger on laptop computer space bar to freeze the footage, "that's not how you pivot. That's not how you catch a pass. That's not how you slide your feet when you're sliding on defense." The next time his guys took the court, whether in practice or in a game, he'd watch those lessons come to life. That created more buy-in from the team. Which encouraged Beilein to teach even more. Which led to the kind of steady improvement that's easy to miss from the outside. 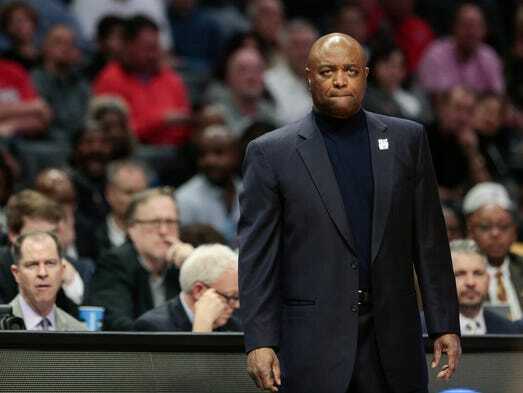 Until Thursday night in the Staples Center, when his Wolverines crushed poor Texas A&M, 99-72, sending them for cover in the Santa Ana Wilderness, and leaving the rest of us to wonder what the heck happened back in Ann Arbor this week? Because the last time we saw them, they needed a buzzer-beating 3-pointer to survive a night of indecisiveness, bumbling and bricks. Yet here were the Wolverines', five days later, creating a symphony of movement inside the Staples Center. Texas A&M couldn't get clean looks. U-M had all the space in the world, like a driver ripping across the 405 in the middle of the night. When you're shooting in the middle of an empty, five-lane freeway, well, it's easy to make 14 three-pointers. Anticipation cleared that space. Preparation led to anticipation. There was U-M's point guard, Zavier Simpson, dribbling off his foot a week ago, now in complete control, hesitating because he intended to. To move his defender. To shift the Aggies' rim protectors. To create a seam to slip through. He was masterful, which didn't surprise U-M assistant coach Saddi Washington. "We talked a lot about trying to do some misdirection stuff to try to set up (our) plays," he said. "We wanted him to cross over and just kind of let the action evolve." But they didn't just talk. They showed him. In film sessions. Again and again and again. Some teams get lost in the minutiae of Beilein's microprocessor memory. Or what his wife, Kathleen, likes to call his "beautiful mind." It's got a USB cord connected straight to him. And if you're looking for an explanation for Michigan's offensive explosion – the Wolverines' 99 points nearly doubled their output after slogging past Houston – those mid-fall tutorials are the place to begin. "Coach B calls it the 'tone at the top,'" said assistant coach Luke Yaklich. "He's the leader. (He) goes into that film room and he's breaking down practices. He's breaking down our walk-through stuff. He's showing guys all the time what they are doing wrong in every possible situation. And I think (the players) look at that and say, 'this guy is working relentlessly.' So should I." The sessions laid the foundation, mortared with all those intricate details. "(The players) know it's part of our culture," said Yaklich. "That you're going to get better on the floor and get better in the film room." 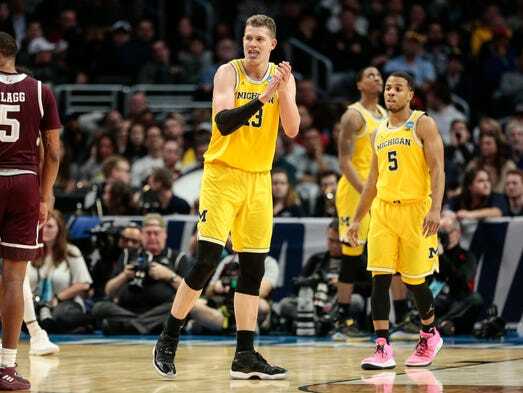 U-M began the year as a (relatively) unknown collection of players surrounding an irrepressible German, junior forward Moritz Wagner. "We are a very confident team," he said. Confident because of its skill, yes. But also because of its ability to process information. These players know how smart and savvy they are. They just don't need to tell you. They'd rather show it. "Remember," said Beilein, "they decided that." They are the ones who've tapped into Beilein's "beautiful mind," a hardwire connection that's led the program to the edge of something memorable. They've gotten here with small gestures and grand belief, borne of infinite lessons. Whether in the Crisler Center as they change their practice-ending cheer or or in the chaos of the visiting locker room at the Staples Center as a growing national media contingent searches for clues, these Wolverines feel like something new. It's out there now. For all of us to see. Even if they've seen it all along. One dark and meticulous film study at a time.